In our community, a 60th birthday is celebrated as a second wedding, with the husband actually tying a fresh “thAli” for the wife….but since we hardly have any family members nearby, he was rather adamant that he didn’t want a “fuss” made over his birthday; he does not celebrate birthdays in general, and couldn’t see why there should be a departure this time. But I secretly asked my sister-in-law to come over from Chennai. 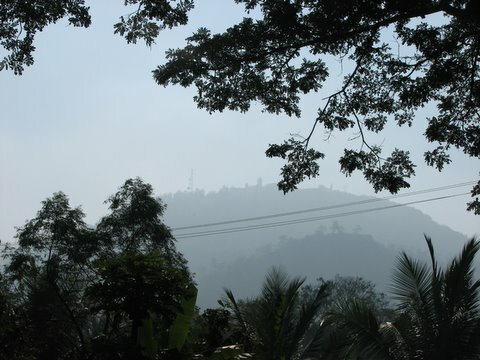 And then, out of the blue, he said, “Shall we go to B R Hills that day?” and, truly delighted, I rushed to comply. I made the booking at JLR, and we were all set to leave at 5am. At 4.30am, he said he had a sore throat and didn’t want to go! But at 9am, when he got up looking quite OK, I insisted that we should go…and certainly, it turned out into a memorable trip, even though just for a day! 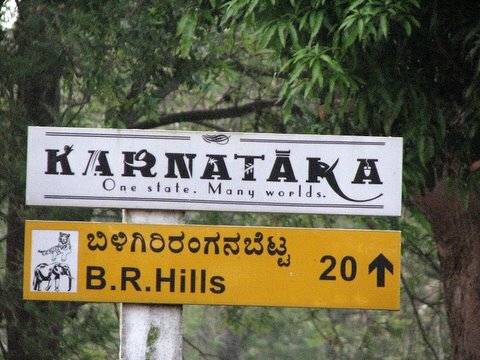 We reached the K.Gudi (Kyathadevararyana Gudi if you want to twist your poor tongue into knots be precise ) Camp of JLR at about 3pm and this too, turned into a mini NTP meet, with Nahar, R Narayan and G S Narayan all being there…and yours truly of course.) 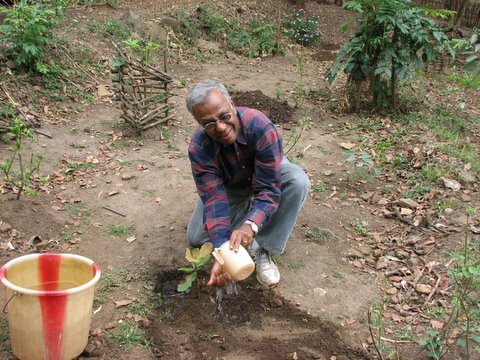 Nahar had organized a lovely tree-planting ceremony for KM, and sampige (champa,magnolia) saplings were planted…I do hope they grow and thrive! As chirdeep_shetty called up and said he, anirudhc and a couple of college friends were going to the K.Gudi property of Jungle Lodges and Resorts , the temptation to visit this favourite property of ours, and also spend a little time with Chirdeep and Anirudh was too much to resist…so we quickly made our bookings and executed a quick sneak very early on the morning of the 3rd, accompanied by amoghavarsha for whom the combination of Chirdeep, Anirudh, B R Hills, and a chance to drive the CR-V was also irresistible! I will have to do a separate post on the Biligiri Ranganathaswamy Temple at B R Hills, and one on Ranganathittu….there was just so much to see and I captured about 1/1000th of it on camera…! Chirdeep had indicated that it was a kind of old boys’ get-together for them, and they would prefer to be separate…but we still managed to bump into each other at Kamath Lokaruchi on the highway! We did both the safaris together, though, and since I had not been able to meet him on his last trip, and his stay in Chicago has been extended further, it was nice to say hi to him. It was also a JLRNTP meet, with Chirdeep,Nahar and myself from the March 06 batch (Vikrant from our batch was in Blr and we couldn’t meet him, alas) , and Anirudh from the March 07 batch…and an INW meet as KM, myself, Amogh,Chirdeep, and Anirudh all post there! 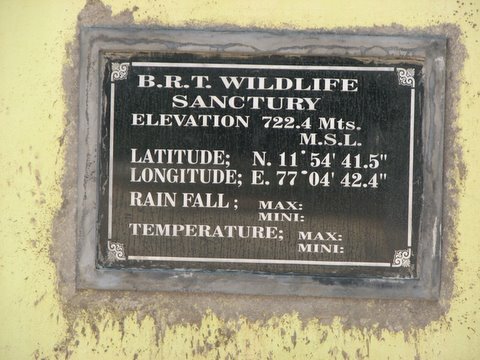 We entered the Biligiri Ranganathaswamy Temple Wildlife Sanctuary,sorry, Sanctury…. 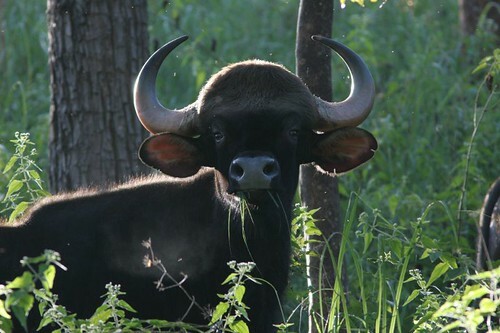 “Well, the Bird Survey conducted by Jungle Lodges and Resorts was warm, wet, and wonderful, several “w”s that I will be explaining in the future, when I have a more time (it’s midnight, and I am going on another trip tomorrow)…..
Here’s the Gaur, the Indian wild bison . Don’t you like his cool haircut? Male Gaurs can weigh up to 750 kg….and all that muscle is developed on a diet, as you can see, of grass! This photo is, I must add, not photoshopped or post-processed, so it may not be very clear or good in terms of colour temperature…Well, to me, documentation is the goal, not the perfect photograph! Q .How did I take this photograph? Will post my account of both the bird survey and our lovely trip to BR Hills and back…meanwhile, “Gaur” means “attention”, too, in Hindi…so…iskO gaur sE dEkhO!